The Sustainability Innovation Pack is packaged, first samples shipped. First select one of five maturity levels you are working on or aiming for. Second: Distribute up to eight champion roles for sustainability business case drivers (such as risks, reputation, workforce, and ecosystem). 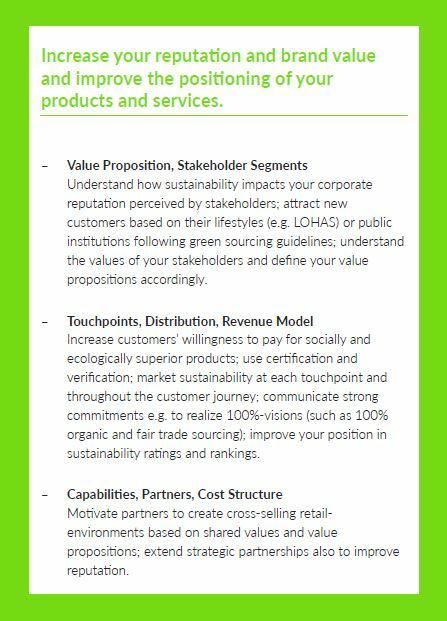 Third explore how to enhance sustainability in each business model component and their interaction, prioritize, challenge. We are proud to develop the sustainability innovation toolkit in close collaboration with Florian Lüdeke-Freund of the University of Hamburg. Challenges: In the challenger phase each champion dictates a challenge (e.g. based on potential disaster in terms of risk, reputation, ecosystem …, e.g. a great disaster in terms of reputation would be if …).